Units of the Syrian Arab Army advanced in the direction of Tal al-Ashari and Jelin town in the western countryside of Daraa after inflicting heavy losses upon terrorists’ ranks and equipment. 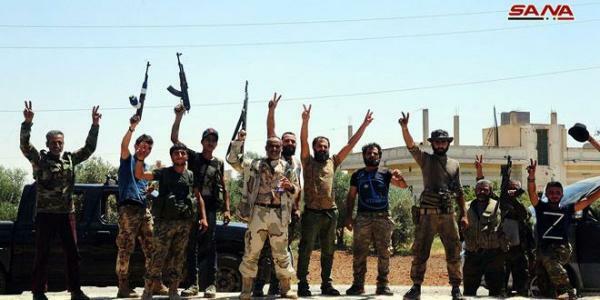 SANA’s reporter in Daraa said that army units operating in the western part of Daraa province carried out artillery strikes in the direction of Tal al-Ashari to the west of Tafas city, expanding its control over the remaining area where terrorists are positioned. The reporter added that army units continued advancing in the direction of Zaizoun town near the Jordanian border till Jelin amid a state of collapse and chaos in the terrorists’ ranks after scores of them were killed and others injured while the rest fled towards the neighboring areas.